﻿The Russians outdo their Chinese counterparts with a competent handheld Mega Drive clone that actually sounds good! There are some givens about buying knockoff handhelds from Ali Express that are time tested and true. Rule 1 is that if the Chinese can put NES roms on something then they will. Rule 2 is to never believe the stated number of games on a device. Rule 3 is that Mega Drive/Genesis clones will inevitably pollute your ears with some of the worst sound emulation possible. Unless you want to shell out for a recapped Sega Nomad, trying to play Genesis/Mega Drive games on dedicated handheld has always been fraught with frustration, as numerous manufacturers, both official and unofficial have consistently struggled with emulating the sound chip of the original device. Countless Blaze and @t Games developed clones have come and gone with the same problem always reported, Meanwhile just as many unofficial Chinese knockoffs have also failed in their task of properly replicating a system that was capable of some beautiful 16-bit music when properly programmed. ​Now, however, it seems the Russians are stealing a march on the Chinese as more and more decent clone hardware is appearing from Eastern Europe and is, in many cases, outdoing the previous waves of Chinese developed tech. 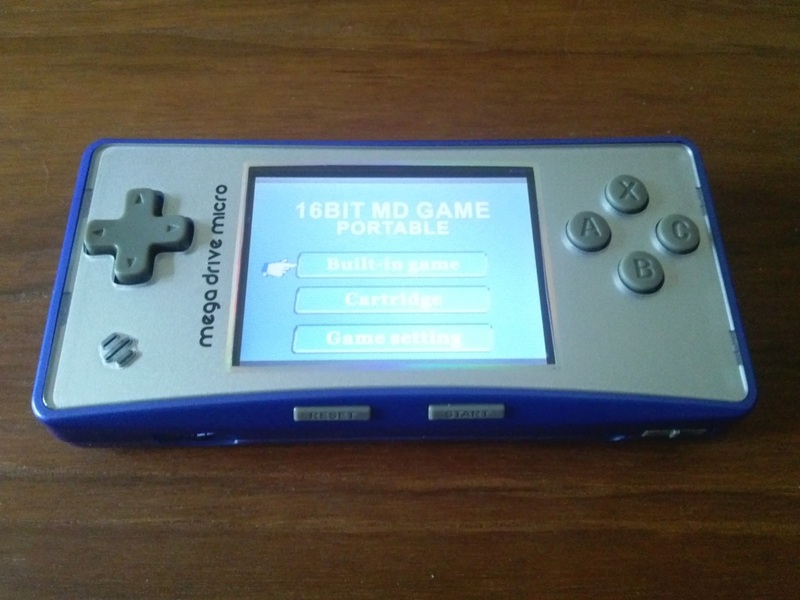 The Game Player Micro (or Mega Drive Micro as the device itself is labelled) is perhaps the sleekest model of Mega Drive/Genesis handheld to recently arrive from those shores. Boasting a crisp back-lit LCD screen, six button layout and an appearance very similar to Nintendo’s Game Boy Micro (including a removable face-plate), it also has a cartridge port that allows its 41 built in games to be bolstered with a series of little Russian knockoff carts (one of which comes with the system, another 3 of which can be bought separately on Ali Express). 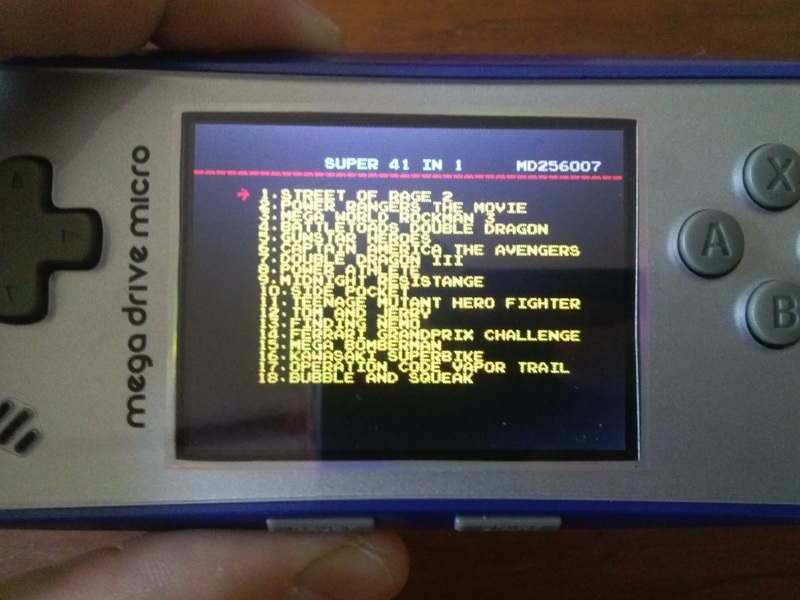 ﻿The Game Player Micro’s front end is also interesting giving players a couple of fairly unique options. The first one allows you to select which region you want your 41 built-in roms to be loaded from. So selecting ‘Overseas’ will, for example allow you to boot up the western title ‘Streets of Rage 2’, whereas selecting ‘Japanese’ will give you access to its Japanese equivalent ‘Bare Knuckle 2’. Curiously a second option allows you to choose from ‘PAL’ or ‘NTSC’ an output that shouldn’t matter on a handheld but does have a direct effect on some games. The aforementioned ‘Streets of Rage 2’ for example, notoriously problematic for sound emulation, is one such title. If played on the default setting the game will have extremely sped-up music, yet changing the setting to PAL, slows down the music to the appropriate speed. The front end display when you turn on the device offers some interesting options. The system comes pre-loaded with 41 western games and their Japanese ROM equivilents. ​Speaking of which, this brings us to the most important factor: that music/sound in general. Quite how the manufacturer has achieved it we don’t know, but both Streets of Rage 2 and Sonic the Hedgehog (another game frequently rendered almost painful to listen to by numerous officially licensed SEGA handhelds from @t games/Blaze) sound just as good as they did on the original hardware. Also absent are graphical issues, such as the screen tearing, found in many of the cheap Chinese Mega Drive handhelds we've played over the years. It’s a joy to finally play both of these games without wincing at some annoying flaw in the emulation. The Micro’s sound output, controlled with a volume slider, is nice and loud although it’s a shame that, as with many of these less expensive handhelds, no headphone jack is present, as this would allow an even better gauge of the sound emulation. Also absent is any option to link the console up to a TV. Unlike many inferior clones that offer AV out. This is a device intended purely for handheld gaming. The screen itself, while beautifully crisp and clear is still a little too small to properly display the complexity of smaller text without glitching it from it's natural colour to a greenish tint. This is an issue common for Mega Drive emulators with smaller screens. It’s a pity, but only a small blot on the Micro’s resume. These games were, after all, designed for a larger screen. The choice of games that come pre-installed on the system form a decent if not always essential compilation. For every Streets of Rage 2, Mega Man compilation or Gunstar Heroes there is shovelware or licensed tat to compensate. In addition, the extra cartridges that can be purchased often contain yet another version of Sonic 1 which feels like a waste. They are also bizarrely stacked in that some contain 16 titles while others only contain 5. English language speakers will also find another problem with these carts. The games are often Russian fan translations. 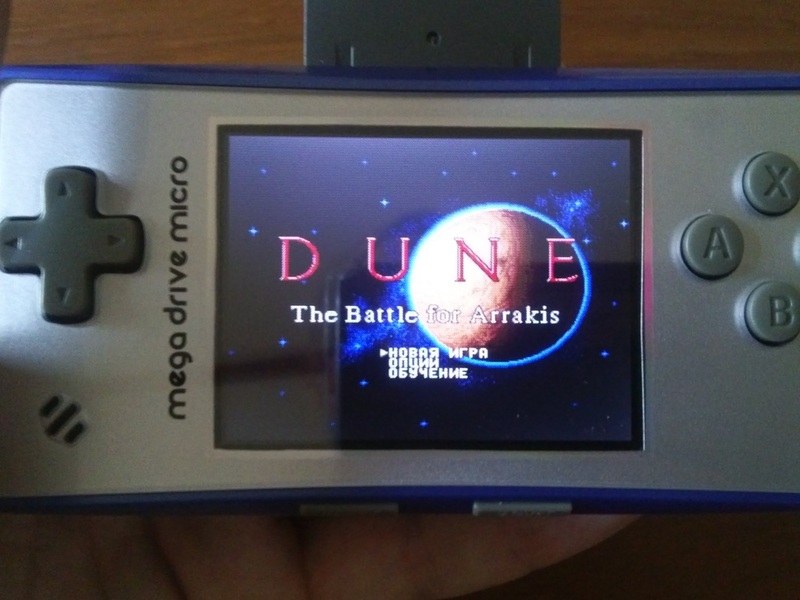 As excited as I was to have Dune 2 on a portable system this was tempered the second I saw Cyrillic script appear. Even Sonic the Hedgehog plays with Russian text. For most games this won’t be an issue, however it’s something that non-Russian speakers should be aware of when buying the unit. Ergonomically speaking, the Mega Drive Micro fits nicely in your hands. Just a little larger than the Game boy Micro, it feels and looks a little cheaper than Nintendo’s shiny metallic device yet the d-pad and four face buttons are comfortable and responsive. The two shoulder buttons are more of a mixed bag, feeling slightly too hard to click down and not as responsive as you would like them to be for something like Ultimate Mortal Kombat 3 (one of the cart based offerings). Battery life is decent but not wonderful (probably thanks to the fact that the lithium batteries that come with these things are almost always cheaply made) and the system charges through an AC adaptor that is bundled with the console. Sadly you cannot charge and play at the same time which is something of a drawback for armchair handheld users. 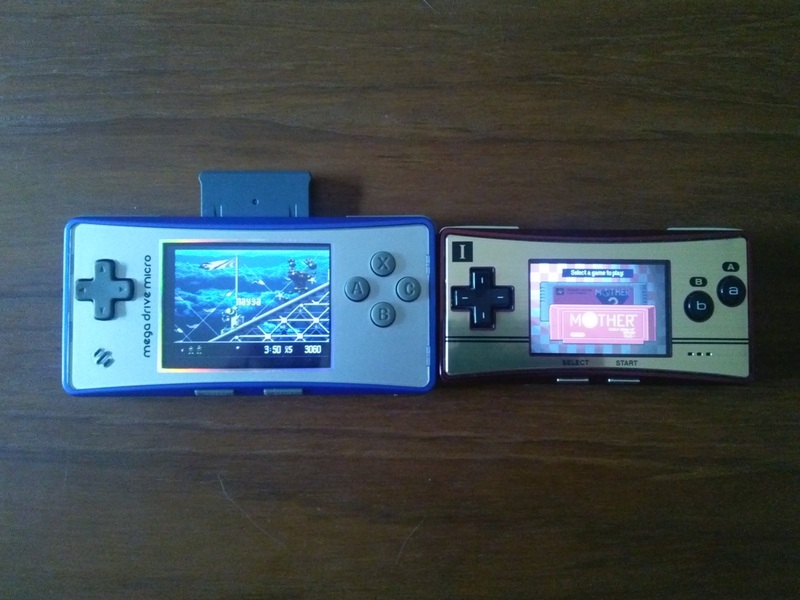 The Game Player Micro is comparable to, if just a little larger than, Nintendo's game Boy Micro in size. Sadly carts stand out like an awkward relative at a party. Note the Russian text below the games title. Sadly for non-Russian speakers this is one of the drawbacks of its games, many of which have been re-translated into Russian. So where does the Micro fit within the pantheon of Mega Drive handheld’s already on the market? Quite honestly, it ranks rather highly. Finally we have a system with above average sound emulation that can play SoR2 or Sonic without the user enduring nostalgia ruining ear trauma. The lack of headphone socket, however, is a bug-bear that could have been avoided with a little more investment. Size-wise it’s the perfect little device to slip into your pocket for a long bus journey. The addition of cartridges is a cute little novelty (although they do protrude in a rather ugly fashion) although not as nice as the SD card feature on inferior Blaze units. The Russian text in many games may be off-putting to some although the option to select PAL/NTSC and Japanese/Western roms is a nice touch. Overall, the Game Player Micro/Mega Drive Micro is one of the best handheld Megadrive/Genesis handheld solutions we have played. It’s to be hoped that, as is so often the case, our Chinese brethren now get to work reverse engineering it and give us an even better version a year or so down the line. With the addition of a headphone jack, TV out and SD card compatibility, that ultimate Mega Drive clone we've all been waiting for might not be such a distant dream after all.